I am in such an odd mood today. I don't know what's wrong with me but the house doesn't feel clean enough, I'm very unsettled and I can't seem to focus my attention to anything for more than 10 minutes. I'm wondering is it a sign that baby is on the way. I was getting a lot of cramps last night and a bath didn't give me much ease but they tailed off before bed and bar a few that woke me in the night I haven't really had any today yet. We did get a minor fright at my 38 week Midwife check yesterday when she couldn't tell if baby was head down or not so we were sent off to Harrogate for a quick scan (and by quick I mean quick!). We were in and out of that room in under a minute as they just squeezed us in between appointments. Thankfully baby's head is fully engaged so now it's just a waiting game to see when he will arrive. In the meantime I'm trying to distract my easily distracted mind by keeping myself busy. 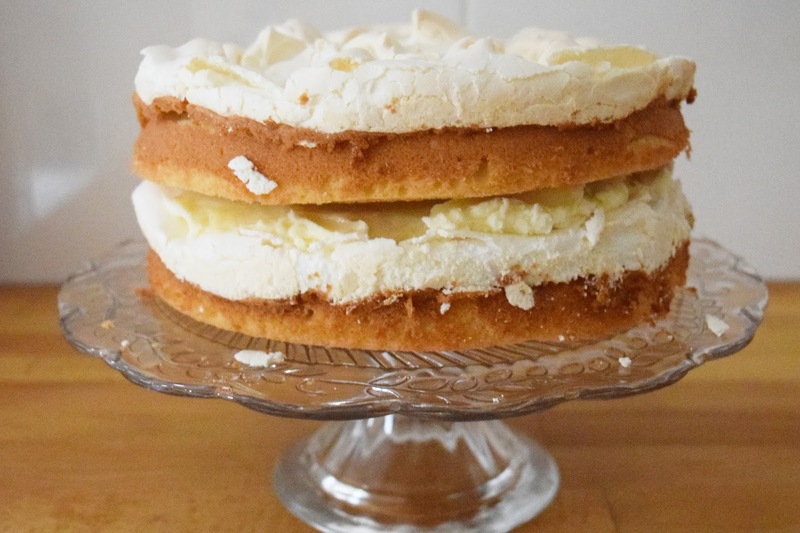 Yesterday I cleared out the big camera and realised I hadn't blogged about this Lemon Meringue Cake that I made for my baby shower two weeks ago. I was sent some Mercers Lemon Cheese Curd and some Red Onion Marmalade from the folks at the BBC Good Food Show and decided my baby shower was a perfect excuse to try out the lemon curd in a cake. I knew I wanted to make something quick and easy, my parents were over visiting that weekend too and I didn't want to be holed up in the kitchen baking when I could be spending time with them. 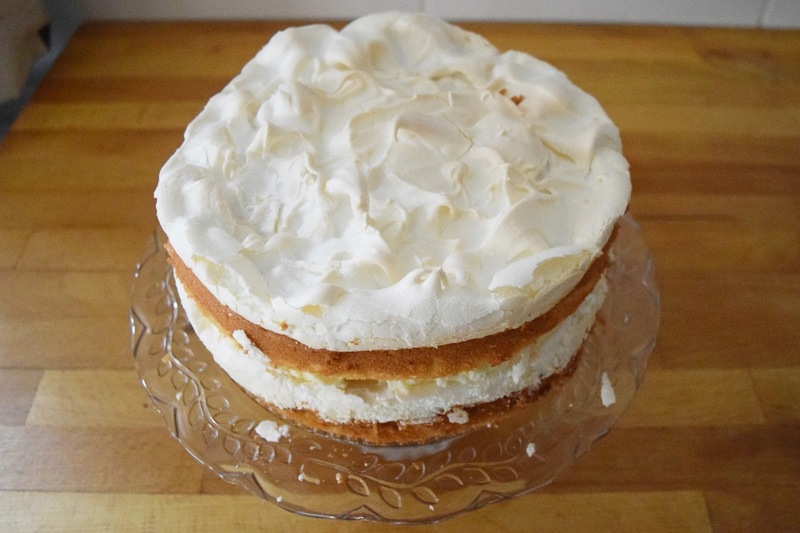 I remembered seeing a lemon meringue recipe in The Clandestine Cake Club Book (pg148) and after a quick read I knew it would be ideal - not too much faff but yummy and indulgent at the same time. I did swap the icing for buttercream as I loathe cream cheese icing and it meant I didn't need to refrigerate the cake either. The curd was delicious and I'm sad I only got a small pot of it to try out, I could easily have used a lot more in the filling! While the cake is baking, make the meringue. Whisk the egg whites until stiff then add the sugar a teaspoon at a time until glossy and firm. Remove the sponges from the oven, and divide the mixture between the two cake tins. Bake in the oven for a further 10 minutes until the meringue starts to turn golden on top. Leave to cool in the tin for 10 minutes before turning out onto a wire rack. To make the filling beat the butter and icing sugar on a high speed until pale, fluffy and mousse like. Add a few drops of milk if needed to loosen it. 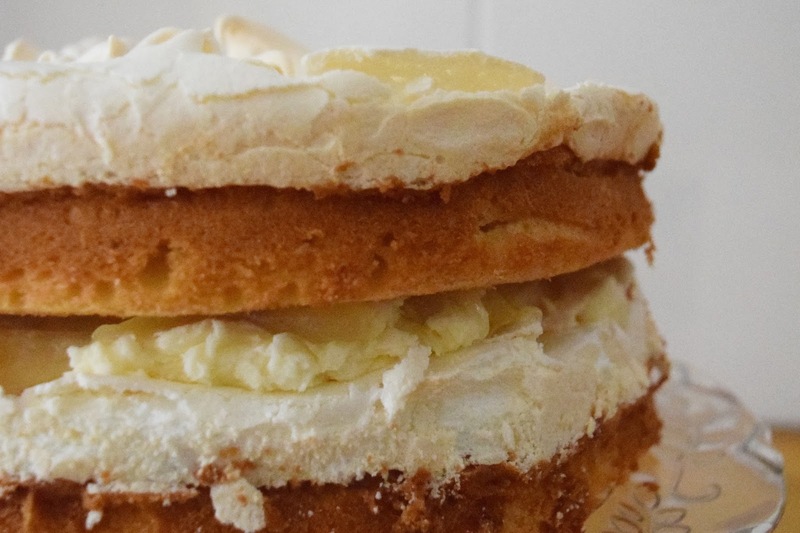 Gently spread over the top of one of the meringues and follow with the lemon curd. Place the second cake layer on top. I bought some of this to add to a cake, but I had to go to the shop twice to buy it. I am still pretty grossed out at the idea of Lemon Cheese. Tasted nice though but I hate the name.